Home › Government Failures › Government losing control of media – so increases control on information. Government losing control of media – so increases control on information. Thank God for alternative media. This coming from an Atheist, it means that much more. The Washington Post is reporting that the Government is increasingly denying media access to federal officials, and I know why. An agency spokesman — frequently a political appointee — rejects the reporter’s request for interviews, offers partial or nonresponsive replies, or delays responding at all until after the journalist’s deadline has passed. Interview requests that are granted are closely monitored, reporters say, with a press “minder” sitting in. Some agencies require reporters to pose their questions by e-mail, a tactic that enables officials to carefully craft and vet their replies. But journalists say the lid has grown tighter under the Obama administration, whose chief executive promised in 2009 to bring “an unprecedented level of openness” to the federal government. The frustrations boiled over last summer in a letter to President Obama signed by 38 organizations representing journalists and press-freedom advocates. The letter decried “politically driven suppression of news and information about federal agencies” by spokesmen. “We consider these restrictions a form of censorship — an attempt to control what the public is allowed to see and hear,” the groups wrote. If it were not for Larry Elder back in 2000 who got me started with his book, The Ten Things You Can’t Say in America, and then Robert Schiller in 2005 with his Yale paper written in the 80’s on housing bubbles, and then Thomas Sowell on economics, Peter Schiff on monetary policy and investing, Thomas Woods on political history, Stefan Molyneux on philosophy and ethical universality (including the non-aggression principle) and Theodore Dalrymple writing about what our future will look like based on his experiences in England (with their Ingsoc), as well as websites like The Drudge Report, Breitbart, Hot Air and institutes for freedom like CATO and Liberty Classroom – I would be no smarter, no more rational, no more logical, no more ethical…than I was 20 years ago, and with no hope of that ever changing for the rest of my life. In short, without alternative media, I would have been a perfect citizen. Such is the power of the internet and alternative media. No longer do CBS, ABC, NBC, CNN, FOX and MSNBC control the information. 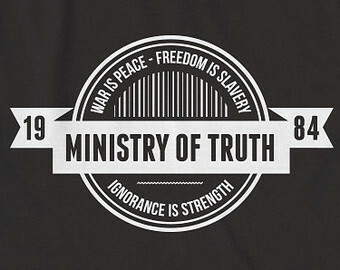 The Ministry of Truth has been flanked by technology, with more and more people defecting these Government cowed sources of information for the truth that is to be found by real journalists and defenders of liberty on the internet. And it’s working. People are learning and reading and listening about concepts and principles and theories that would never have been available to them otherwise. And how do we now it’s working? Because Government censorship has retreated from the front lines of the 6 o’clock news to the source of the news and information itself. Government is abandoning transparency. Our Government is hiding emails, losing hard drives, accidentally failing to backup data and information, ignoring FOIA requests, redacting expansively and gobbling up all our emails and texts and cellphone information while simultaneously cutting off access to Government officials from the media…all media, in an effort to crank up the drawbridge, pull down the blinds, close the curtains and continue its nefarious tyrannical operations under the cloak of darkness and an information vacuum. It will know about you. You will not know about it. In this, they share the same proclivity as rats and cockroaches. Your Government; not yours anymore. ‹ Federal Court rules Jewish baker required to make Hitler cake for Nazi celebration?